Throughout my pregnancy, I’d have to say that breakfast foods have been a consistent craving, or rather food preference. Which is fine, since we eat good, local eggs, homemade jam, and good (sometimes homemade) bread. I also have been going through a lot of yogurt, and the organic choices out there just seem to be getting more plentiful. Yay! There’s nothing better with some thick, creamy yogurt than some good, crunchy granola. I’ve bought my share of it over the last 7 months, some of it good, some of it, not so good. So when I started searching for my own recipe, I stumbled upon one easy, healthy recipe from CHOW. It’s super simple, economical, and my favorite part is it’s flexible. Once you’ve got the base, you can pretty much add anything you want in the way of dried fruit, nuts, seasonings and seeds. I also like that you know exactly what’s going in. Even with some of the natural or organic cereals and granolas out there, I still find words I don’t understand in their ingredient lists. 1. In a large bowl, stir together three cups of old-fashioned rolled oats (not quick oats), three tablespoons brown sugar, a quarter teaspoon kosher salt, and a half teaspoon cinnamon. 2. In another bowl, stir together one-third cup honey (I used maple syrup), a quarter cup canola oil (I used grapeseed- canola is pretty much guaranteed to be GMO), and a teaspoon of vanilla. Dump this over the oat mixture and combine thoroughly. Get your hands in it to mix everything well, and to coat the oats evenly with the honey mixture. Heat the oven to 300 degrees Fahrenheit. 3. Spread the mixture in a thin, even layer on a baking sheet and place on the center rack of the heated oven. 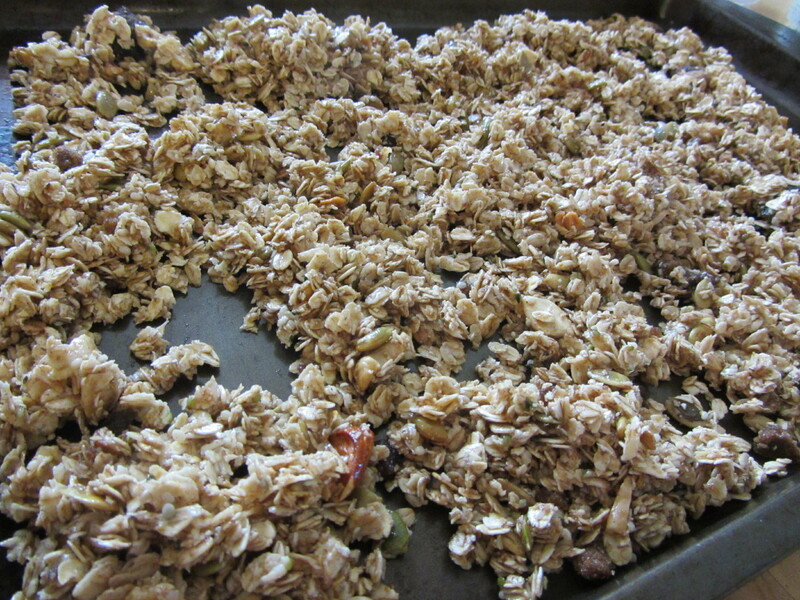 Bake, stirring after 15 minutes, until the granola is a very light golden brown. It should take 20 to 30 minutes. If you like your granola crunchier with a toastier flavor, bake it a little longer, keeping a close eye on it—if it gets dark it will taste burnt. 5. 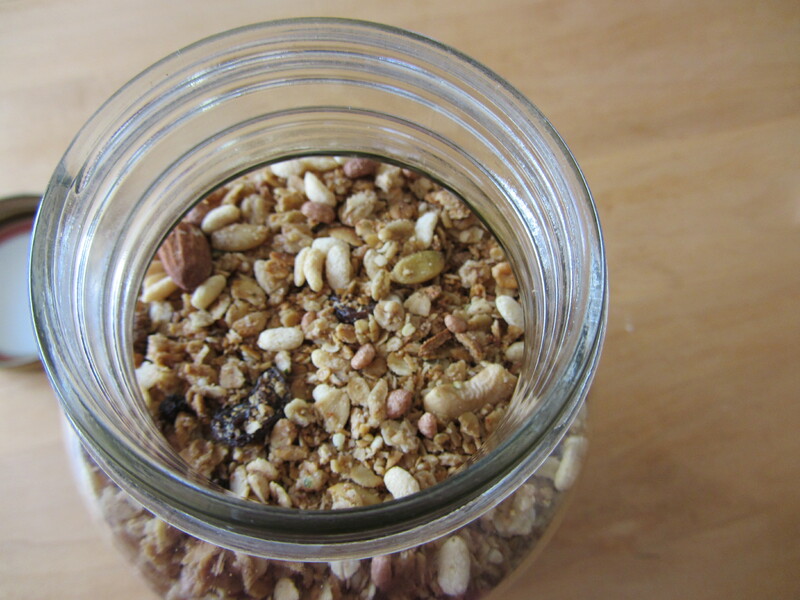 Once the granola’s cool, get creative: Now is the time to stir in all your extras like dried fruit, raw or toasted nuts and seeds, toasted coconut, etc. 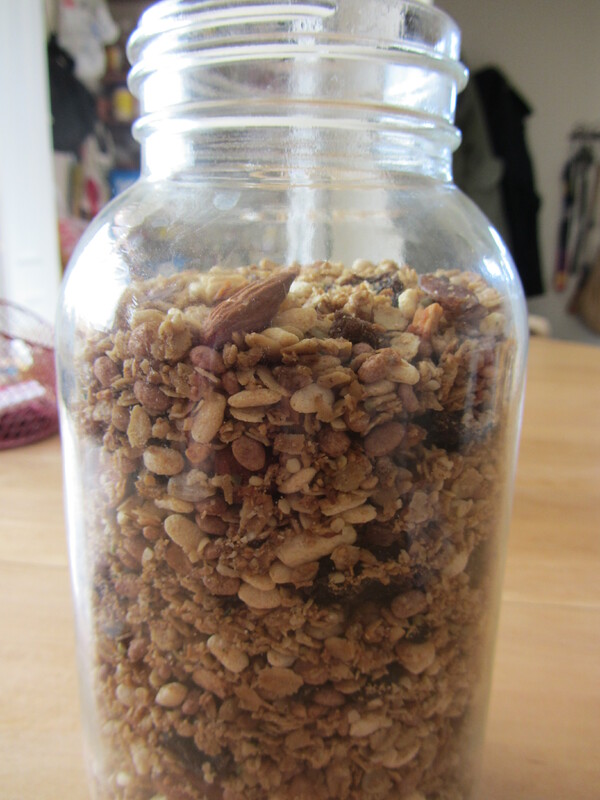 Store in an airtight container (this is very important—the granola goes stale easily) and eat within two weeks. A couple of things with this recipe I did: the first time I made it, I added just about everything I could think of, coconut, bran cereal (hubby bought and never eats), nuts, dried fruit.. The last time I made it, I added a handful of trail mix, some rice crisps, pumpkin seeds and hemp hearts. Both were good and it all depends on what you like in your granola (I’m not picky). 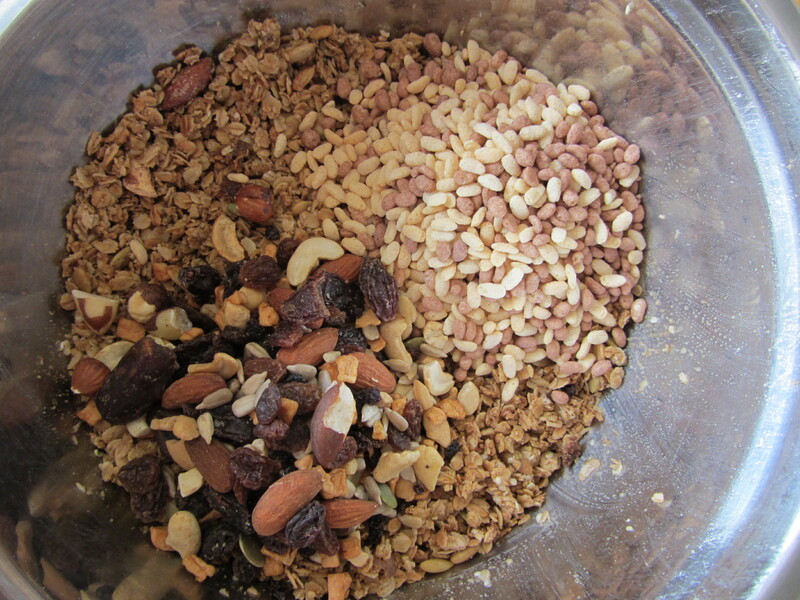 My suggestion is to add your nuts & seeds in with the granola when you bake it- it helps bring out their flavor. Don’t do this, however with your dried fruit, or it will dry it out even further. 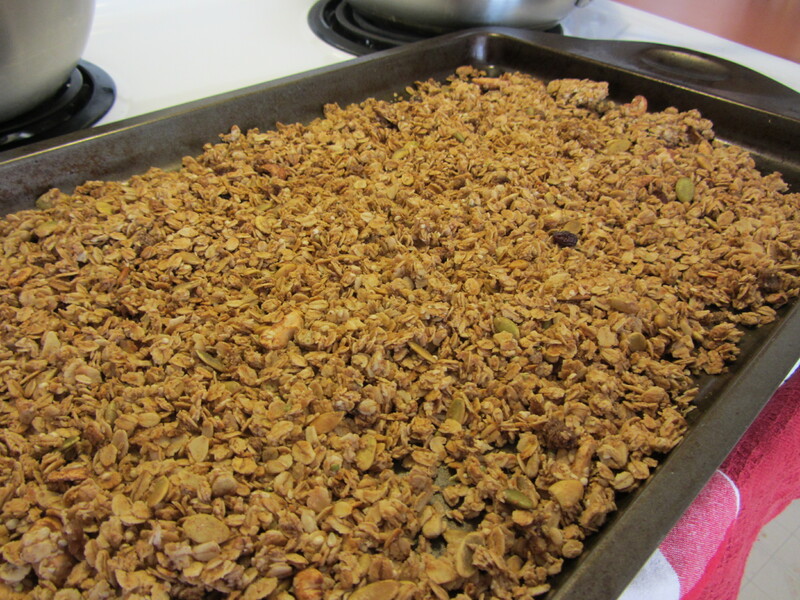 This entry was posted in Recipes, Uncategorized and tagged granola by Ashley. Bookmark the permalink.